n 1933 he started with the Sexteto Típico Los Indios, a name he adopted inspired in a polo club. Its initial personnel was: Emilio Aguirre and Francisco Ferraro (bandoneons), Antonio Arcieri and Pibetti (violins), Emilio Méndez (double bass) and on piano, its leader, Ricardo Tanturi. 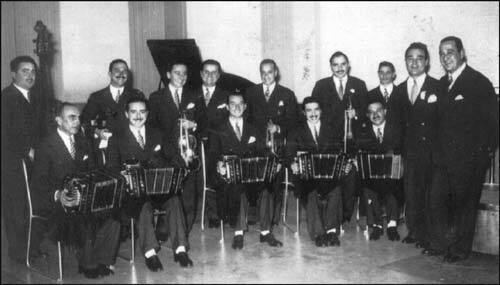 In 1943 the orchestra was formed by Armando Posada (piano), Francisco Ferraro, Héctor Gondre, Jose Raúl Iglesias, Emilio Aguirre and Juan Saettone (bandoneons), Armando Husso, Norberto Guzman, Alberto Taido and Vicente Salerno (violins) and Enzo Raschelli, later Ramon Outeda (bass), Alberto Castillo and later Enrique Campos as singers, this would be the base staff until its dissolution in 1951. In his tango orchestra he had, in its different stages, musicians of outstanding quality. For this work, we shall mention the names of those who best represented the aggregation. Vicente Salerno: violinist born in Buenos Aires in 1907. He soon had his own orchestra which appeared on radio stations. Later he joined the orchestras led by Raúl Kaplún, Nicolás D'Alessandro, Francisco Lauro and, especially, for over twenty-five years he was the lead violinist for Ricardo Tanturi. His work as composer and author was interesting and succeeded in recording, with Tanturi, eight of his numbers: “La serenata (Mi amor)”, waltz; “Qué podrán decir”, “Yo sé lo que te digo”, “No la nombres, corazón”, “El corazón me decía”, “Anselmo Laguna”, “Esta noche hay una fiesta”, “Qué bien te queda (Cómo has cambiado)”. Also “Estas chicas se quieren casar” and “Muchachos escuchen” with lyrics by Carlos Lucero. Armando Posada: pianist born in Barracas on December 9, 1914. At age twelve he already played, like many other musicians, in the intermission shows of the movie theaters. In 1936 Tanturi, who had not yet recorded, appeared with the young pianist, who was only twenty-two, at the River Plate old stadium on Alvear Avenue and Tagle, opposite the Automóvil Club Argentino headquarters. The remarkable thing is that he continued along with the leader until the latter decided to put an end his thirty-year career. Antonio Arcieri: violinist, born in Buenos Aires in 1909. He started when he was a boy as member of a quartet with Antonio Sureda (bandoneon), Humberto Canataro (guitar) and Juan Carlos Aquilini (piano). Later he switched to the group fronted by Adolfo Avilés. He put together the Trío América, quite successful, along with Aquilini and Sureda. Thereafter, the Orquesta Rostan (name that combines the surnames Rosich and Tanturi). For a short tenure he played in the aggregation led by Julio De Caro. In the late 20s he led the Orquesta Los Matreros in which Juan Carlos Miranda was on vocals. As composer he wrote, among other tangos: “Delirando”, “Campanario”, “Pinta orillera”, “Cachivache”, “Derrotado”. His first composition was: “Mi nena”. José Raúl Iglesias: bandoneonist, born in Avellaneda in 1913. At age seven he began to study his instrument. He made his debut with a group in his neighborhood and only two years later he joined the Tanturi orchestra. He stayed until the leader quit the musical activity. Tanturi committed to record seven of his numbers in collaboration with Juan Bautista Gatti: the waltzes: “Al pasar” and “Mi romance”, the tangos: “Ana Lucía”, “Cuatro recuerdos”, “Desde lejos”, “Igual que un bandoneón”, “No la nombres, corazón” and “El tango es el tango”. Bernardo Sevilla: violinist born in Spain on April 14, 1904. Or on April 17, according to different authors. He began with classical music but soon he devoted to tango. He worked as a musician on a ship that entered the United States several times. His thirty-year career was with the aggregations of Manuel Buzón, Julio De Caro, Federico Scorticati (as lead violin), Landó-Mattino, Miguel Nijensohn, Florindo Sassone, Carlos Marcucci, Pedro Maffia, Pedro Laurenz, Alfredo Attadía and a busy season with Tanturi. He played in the groups that accompanied Alberto Marino, Tania, Héctor Mauré and María de la Fuente. In 1932 there was a group with good players but with a short tenure: Los Magos del Tango with Daniel Álvarez and Nicolás Pepe (bandoneons), Juan Polito (piano), Sevilla (violin) and Roberto Arrieta on vocals. Héctor Gondre: bandoneonist, born in Buenos Aires on October 27, 1920. He began with a juvenile orchestra named Claudio, of an unknown career. In 1939 he joined Tanturi and played all the bandoneon solos. In 1961 he quit to put together his own orchestra. With it he accompanied, among others, the singer Osvaldo Ribó in some recordings and the female Singer Silvia Del Campo, wife of the horse racing commentator, Mineral. Francisco Ferraro: bandoneonist born in Buenos Aires on July 27, 1909. He made his debut with Eugenio Nobile at the Palais de Glace. Later he swapped to a group led by Antonio Tanturi and, in 1930, to a team by Ricardo Tanturi and the jazzman Raúl Sánchez Reynoso whose repertoire, logically, included tangos and syncopated music. With the Tanturi orchestra he was from 1933 to 1950, year when he decided to quit show business. 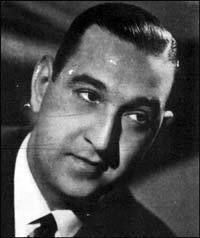 Horacio Perri: bandoneonist, born in the neighborhood of Barracas, on November 15, 1914. When he was a teenager he debutted with Roberto Firpo, and later he worked with Carlos Marcucci, Roberto Zerrillo, Miguel Caló, Orquesta Los Mendocinos led by Francisco Lauro, Rodolfo Biagi, Héctor Varela, also with Francisco Canaro and, finally, fifteen years with Tanturi. “El expreso platense”, “Musa de antaño” and “Bailongo de patio” are some of his tangos. Natalio Berardi: string bass player, born in the neighborhood of Palermo on January 1, 1920. For many years he was member of the Tanturi orchestra, he also played, among other aggregations, with the one of Jorge Dragone and the one led by Miguel Padula until he quit music and devoted himself to carpentry. Eduardo Salgado: violinist from Mendoza, born on August 5, 1922. In 1946 he settled in Buenos Aires to play in several outfits. He appeared with Pedro Laurenz, Campos-Calabró, Francisco Rotundo, Rodolfo Biagi, Edelmiro D’Amario, Alfredo Gobbi and, as from 1956 with Tanturi. Horacio Roca: singer born in the neighborhood of Almagro in 1929. He had a short life, he passed away in 1969. He joined the orchestra in the 50s. And, soon thereafter, the leader was on leave until 1956 when he put together a new group and again summoned Roca and also Elsa Rivas and Juan Carlos Godoy. He recorded eight times as soloist, three in duo with Alberto Guzmán and one teaming with Rivas and Godoy. His last orchestra was the one of 1965 and it had a very short tenure. Its players were: Armando Posada (piano), Natalio Berardi (double bass), Santos Maggi, Horacio Perri, Ricardo Varela, José Raúl Iglesias and Ezequiel Esteban (bandoneons), Antonio D'Alessandro, Emilio González, Fidel De Luca and Orlando Perri (violins). Other musicians that passed through his ranks were: Enzo Raschelli (double bass), Luis Cuervo, Milo Dojman, Armando Husso, Norberto Guzmán, Alberto Taido (violins), Juan Saettone (bandoneon). His vocalists: Alberto Castillo, Enrique Campos, Blanca Bassi, Roberto Videla, Jorge Falcón —the latter, much less known than the one with the same name that sang with Héctor Varela— succeeded in recording a long-playing record on his own, with his photo on the front cover (personal problems made him soon quit show business); Juan Carlos Godoy, Horacio Roca, Alberto Guzmán —in fact, Alberto Russo, but Tanturi renamed him to remember his lead violinist Norberto Guzmán who had died at a young age; he later devoted himself to tropical rhythms as Alberto Garda, settled in Colombia, was successful and cut a large number of discs—, Carlos Ortega, Osvaldo Ribó and Elsa Rivas. Texts taken from: the magazine Buenos Aires Tango Club Nº 12 and notes from the Horacio Ferrer’s book La historia del tango and discography by Nicolás Lefcovich.